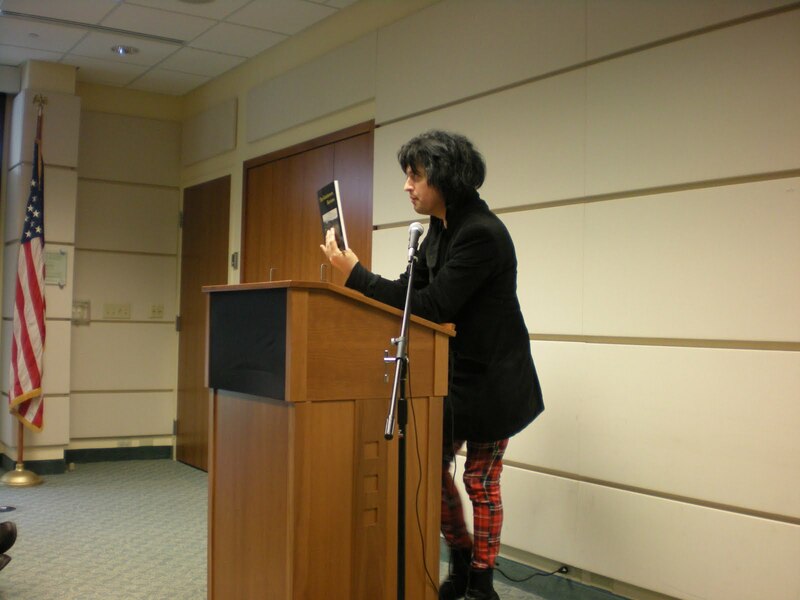 I wish I could meet poet Sherry Chandler in person, but she lives in Kentucky and here I am in New Jersey. However, we share the same publisher, Wind Publications. 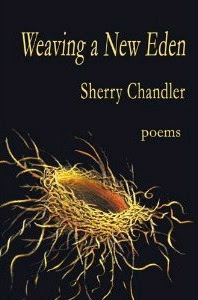 I recently read Sherry's first full-length collection, Weaving a New Eden, and really loved it. It's full of women's voices, history, story, and terrific poetry. I felt transported to the Kentucky of years ago. 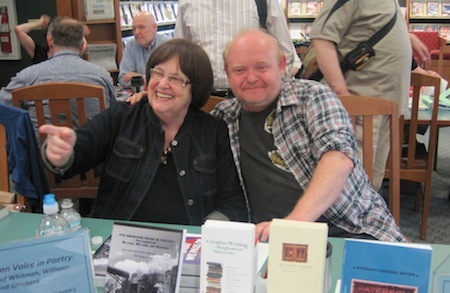 But since I'm not there then or now, I've invited Sherry to join me here for an online Poetry Salon. So please pull up a chair. Sherry will first talk to us about her book. Sherry: I had a twofold purpose in writing these poems. One was simply to preserve my mother’s voice and some of the stories she told me about her rural childhood between World Wars I and II. 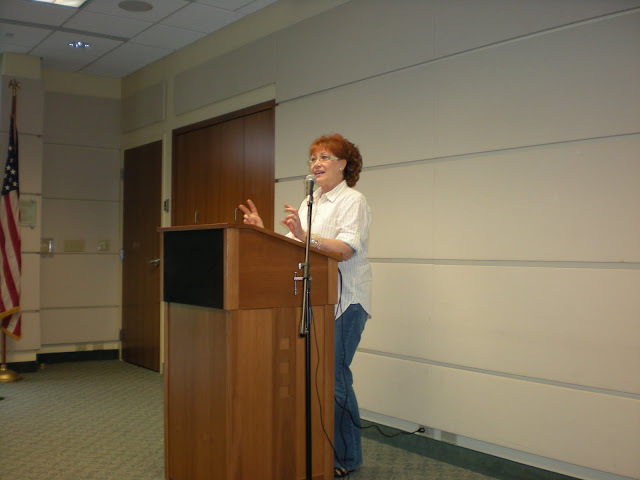 This is work I began with my Finishing Line chapbook, Dance the Black-Eyed Girl. I am always struck by the contrast between the cultural modernism of history books and the rusticity of life in our rural and small-town backwaters. In many ways, when my mother was born in 1917, life for farm women in Kentucky hadn’t changed a lot since Rebecca Boone’s day. Eventually a friend suggested that I could take the poems all the way back to Rebecca Boone. So I wrote a grant that was funded by the Kentucky Foundation for Women. 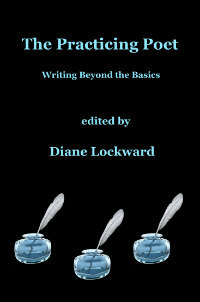 It allowed me to work with Leatha Kendrick as an editor and guide to assembling the manuscript. It was Leatha who urged me to keep a lyric presence in the book along with the persona poems. One model was Natasha Tretheway’s Native Guard and another was Ellen Bryant Voigt’s Kyrie. My treatment of Rebecca Boone was highly influenced by Maurice Manning’s previous treatment of Daniel Boone in A Companion for Owls. The rest was a matter of reading copiously and finding tidbits about women that could be used to create a character. For my grandmothers, I leaned heavily on genealogical work generously shared by others. Form played a tremendous role in helping me differentiate so many voices. Rebecca Boone speaks mostly in the best approximation I can achieve of blank-verse dramatic monologue. I think of her as my Shakespearean character, the Chorus who steps to the edge of the proscenium and comments on events. She knows more than she could possibly know. Other characters speak in Ginsberg’s American sentence (a form I think I learned about on your blog), a ghazal, a triolet, and acrostics. The constraints of form forced me away from my own voice and provided me a way to give each speaker her own rhythm and mood. Sherry: Because the title is Weaving a New Eden, I had at first suggested that we use something like a landscape as a tapestry coming off a loom. That turned out to be a better idea in theory than in execution. Then Wind publisher Charlie Hughes suggested that we turn to Suzanne Stryk for suggestions. We were still looking for landscape, and we tried several, but they were too Edenic in the Biblical sense, with trees and snakes and such. Then Suzanne suggested floating this nest on a near-black background and it was just perfect – there was the weaving, the wilderness, the disconnectedness. I could not be more pleased with the cover of this book. And I urge everyone to visit Suzanne’s website and experience some of her art. Diane: Why did you title the book Weaving a New Eden? Sherry: When Kentucky was being settled, it was promoted by land speculators as a New Eden, and, as I’ve said, some of the romance lingers. Kentucky is still a beautiful verdant place, though mountaintop removal mining is ruining our mountains. Nevertheless, the New Eden aspect was always a part of the story. 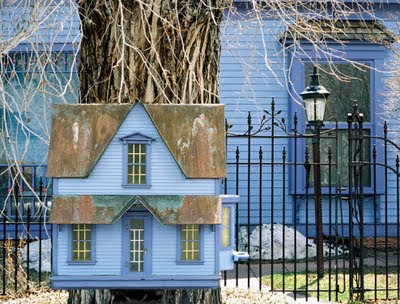 When Maurice Manning reviewed a selection of the poems, he suggested that eventually, as I kept writing, an over-arching metaphor would emerge. That metaphor was always weaving. Early on, I knew that I wanted Rebecca Boone to be a weaver. The Boones had been cottage weavers in Wales and carried the skill with them to the United States. And, of course, weaving was an essential skill for women on the frontier. In one source, I read that worn-out clothes were a major hindrance for men who came into Kentucky to claim land. Nakedness caused some of them to turn back. So when “Rebecca Boone’s Loom Has Its Say,” what it says is that “My cloth provided cover for a conquest.” Further, weaving is as mythic as Eden itself. And finally, I use weaving forms of poetry – pantoum, sestina, sonnet crown – so you might say the title was inevitable. What you might call the title poem, “Rebecca Boone Weaves a New Eden,” is a monster sestina that took me weeks to get right. At one point I had to just scrap it and start over. And yet, I felt I had to get it right, had to have it in the book. Sherry: Friends and acquaintances who have read this book have compared it to a saga. Some even say they can’t put it down, so on the simplest level, I want readers to find this book a good read. Others have said it’s a history book, and I would like readers to learn a little bit about the complexities of history and the cost of U.S. expansionism. Although Kentucky is a backwater now, the move to cross the Appalachians was the first very important step in accomplishing Manifest Destiny. I wouldn’t mind if readers finished the book with a new respect for the possibilities of form as a way to create dynamic poetry. Most of all, I want readers to hear these women, to hear the woman’s side of the story. These grandmothers of mine are individuals, but I hope they are also everywoman. into the palm of her hand? or did she just eat an apple? Sherry: I wrote many long serious poems in Weaving a New Eden, but from time to time I did try to strike a lighter, more whimsical note. I wrote a limerick, a roundeau, a triolet; I wrote a poem in the voice of a cat, but of all the lighter pieces in the book, this nonce-form, rhyming poem is my favorite. For one thing, it is just mouth candy. I wrote it for sound, to chime and rhyme. But I also like this notion of Rebecca as a reverse-Eve, who eats the apple and enters Eden. Has her cake and eats it, too. I think I got a brilliant inspiration when I thought to equate the apple juice running into the creases of her palm with the streams running through the Bluegrass savannah, identifying Rebecca’s body with Kentucky. I was eating an apple myself at the time. Winesap and Northern Spy are legacy varieties of apple, but I don’t know if their legacy stretches back to the 18th Century. I’m also told that people in the Boones’ time didn’t eat apples the way we do, but rather used them for cider and cooking. But I think humans have always snapped their teeth into apples. Diane: Now let's all gather round while Sherry reads her poem for us. Party Time! 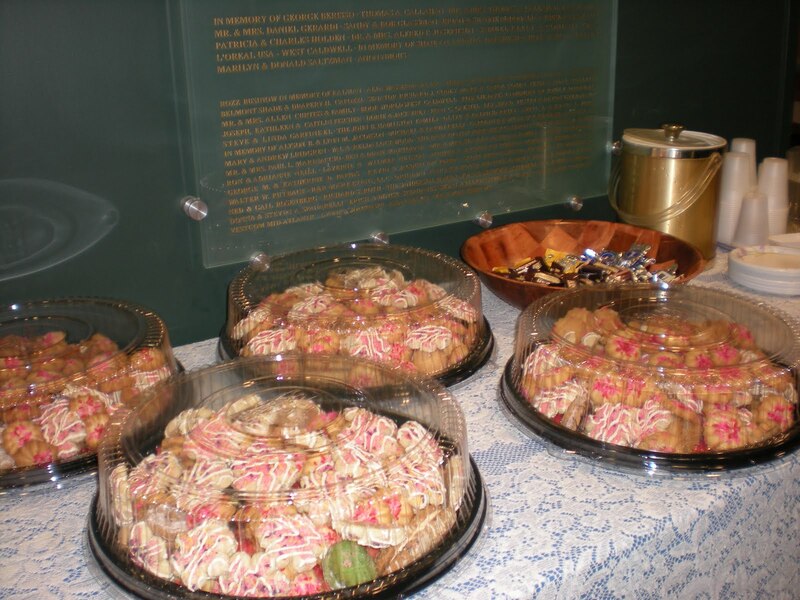 Sherry has put together a delicious assortment of Kentucky goodies. Please help yourselves to fried apple pie, moonshine juleps sweetened with maple syrup and sprigs of peppermint, and hoe cakes drizzled with sorghum molasses. Sherry says, "Not exactly dainty fare, but all these foods are mentioned in the book." Before you leave, be sure to pick up a copy of Sherry's book. You'll be glad you did. Then while you enjoy your snacks, please feel free to leave some comments or questions for Sherry in the Comments section. 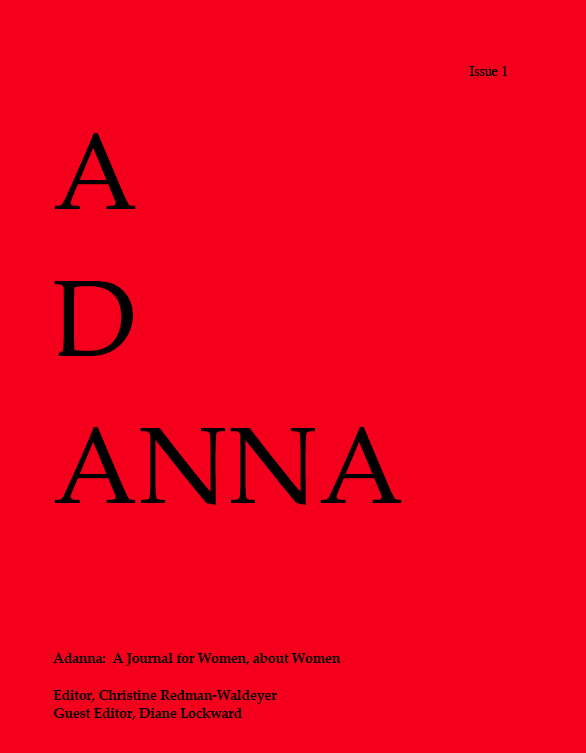 The first issue of Adanna is coming soon! 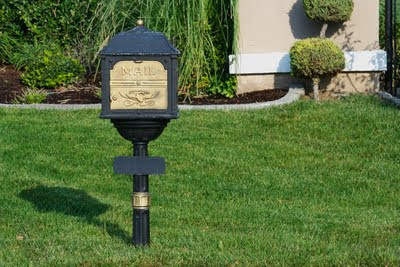 Editor Christine Redman-Waldeyer expects to have the journal ready for mailing in June. She is offering the half-off price of $5 until May 31. That includes shipping and handling. After that, the price will be $10 per copy which is still a great bargain. Click HERE to order. You can use PayPal or snail mail. Submissions have now closed. The list of contributors—and it's an impressive list—is available at the website. We have a total of 59 contributors who represent many states in the US as well as several other countries. The journal will include poetry, short stories, non-fiction pieces, and one book review. Christine and I are thrilled with the work in this first issue. We thank everyone who submitted. It's that time of year again. 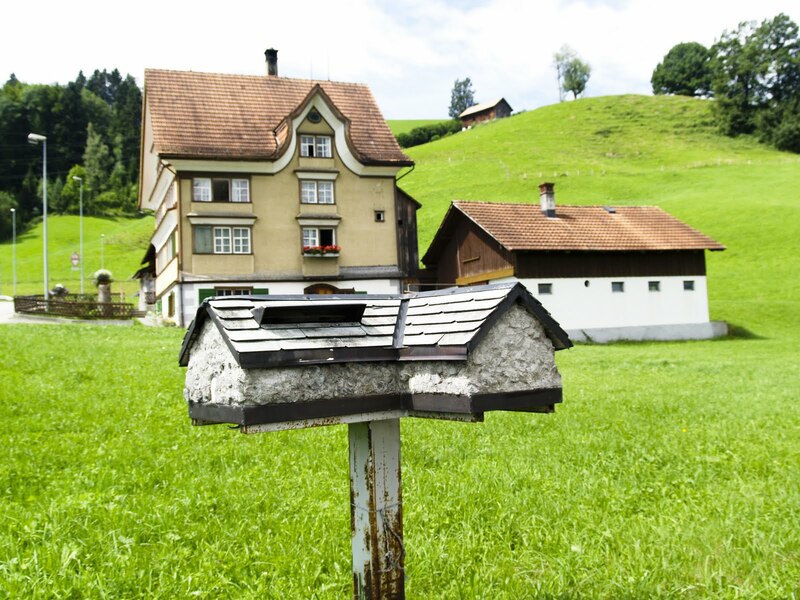 During the summer many of us have more time to write and submit, but quite a few journals close their doors to submissions for the summer months. Do not despair. There are still many journals that do read during the summer and some that read only during the summer. This is the first of a 3-part list of those journals. I have given it a somewhat cursory updating, so if you note any errors, please let me know. These are all print journals. Sadly, a number had to be removed this year as they have closed their doors permanently. 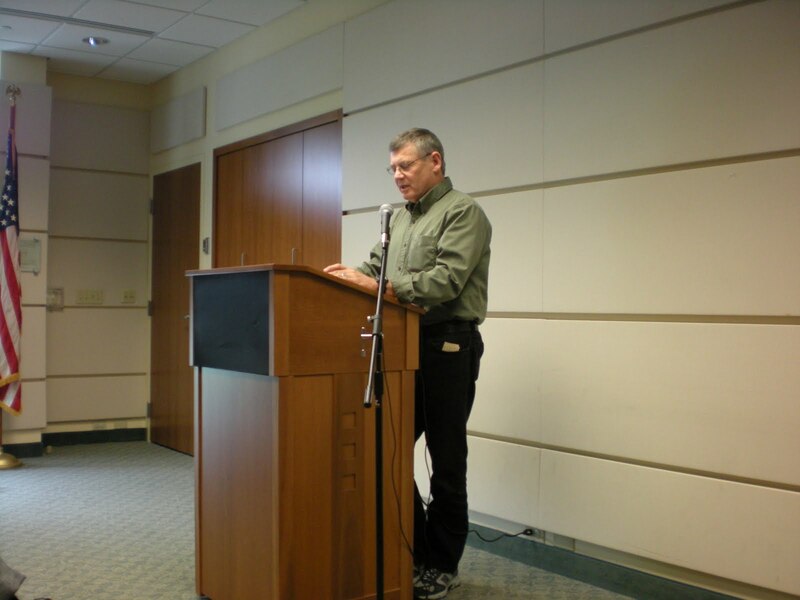 Yesterday was the Poetry Festival: A Celebration of Literary Journals. This is an event I began 8 years ago with the idea that it would be a one-time thing. 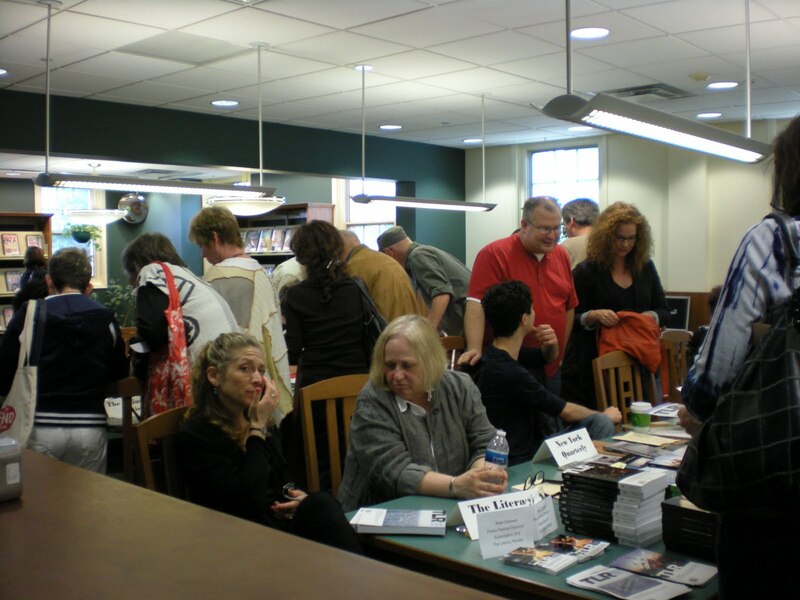 However, the West Caldwell Library, which hosts the event, wanted to do it again the next year, and the next year, and the next. So did the poets and the editors. Me too. It's now become a tradition. I invite the editors of 12 journals to participate. 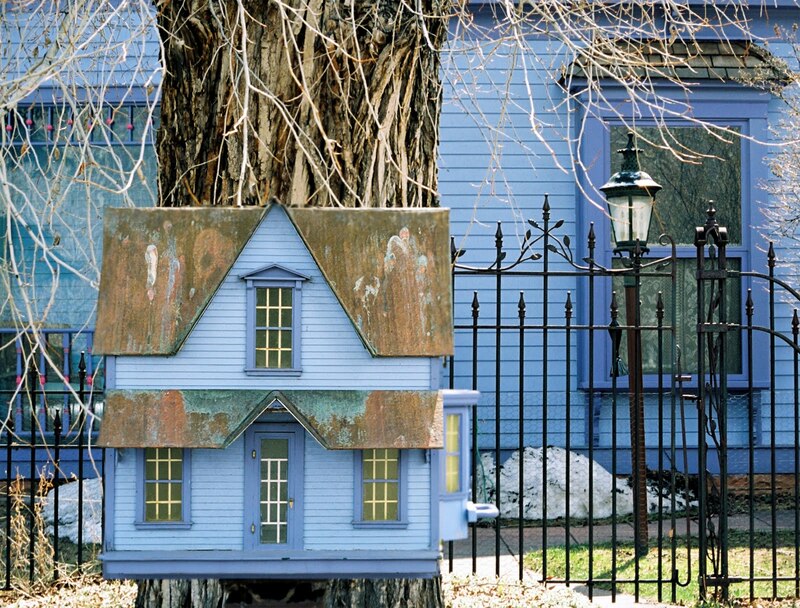 I ask them to each invite two poets to represent their journal. 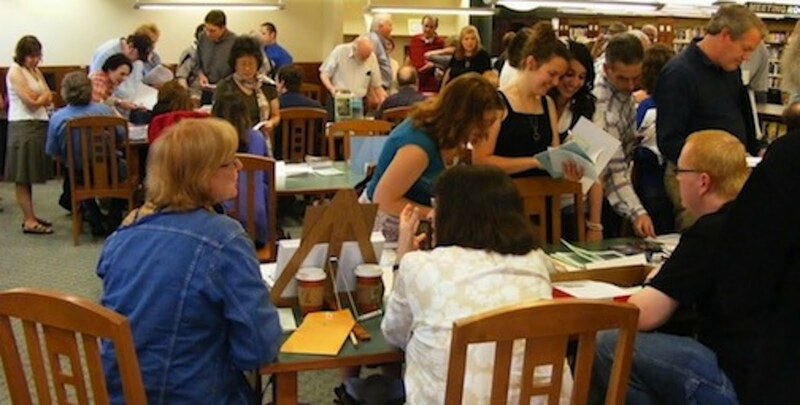 The event is always held on a Sunday, 1:00 - 5:00 PM, a day the library is closed to the public. 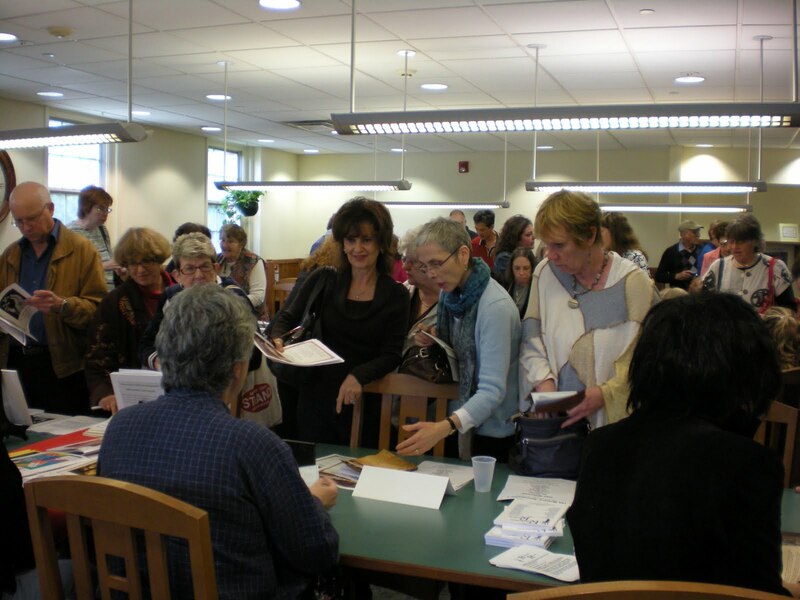 However, the library opens for the event and the public is invited to come. The Assistant Director works with me during the planning stages of the event and is present throughout the day. Volunteers man the book sale area. The editors and journals set up in the Reference area, two journals per table. Computers are turned on around the perimeter of the room so that journal websites can be displayed. Editors answer questions and provide subscription information and submission guidelines. Journals are available for purchase. The readings are held in another room, The Community Room. I divide the afternoon into four 30-minute sessions. Three journals—6 poets—read during each session. 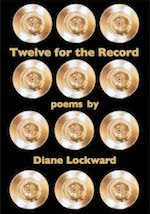 I introduce each editor who then describes his or her journal and introduces the two poets. 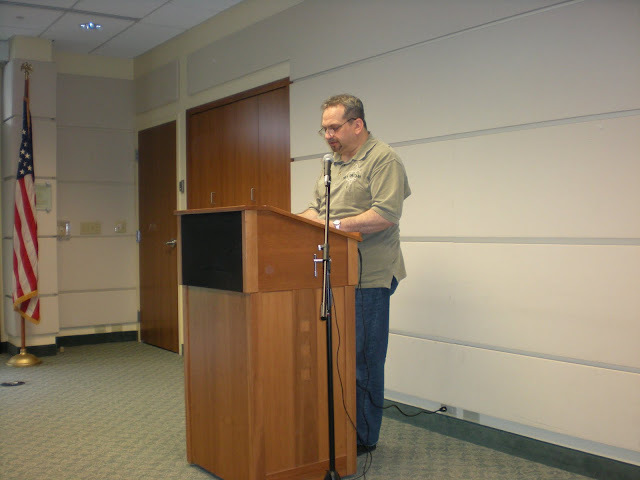 Each poet is asked to read two poems, totaling no more than 5 minutes. Following each reading session, there is a 20-minute break, during which time people browse the journals. There is also a Book Sale area at the front of the library where reading poets can offer books for sale—one title per poet. Book sales were down this year which was my one regret. However, journal sales were up and that's good news as the primary function of the day is to honor the journals that make it possible for us to publish our work. We had a really good turnout, and everyone seemed to have a great time. Here are some photos which tell their own story. Cookies donated by the West Caldwell Shop-Rite. These and the candy added to the fun. Audience. Notice the extra chairs at the back and the people standing in the doorway and hallway. Don't all these people look happy? 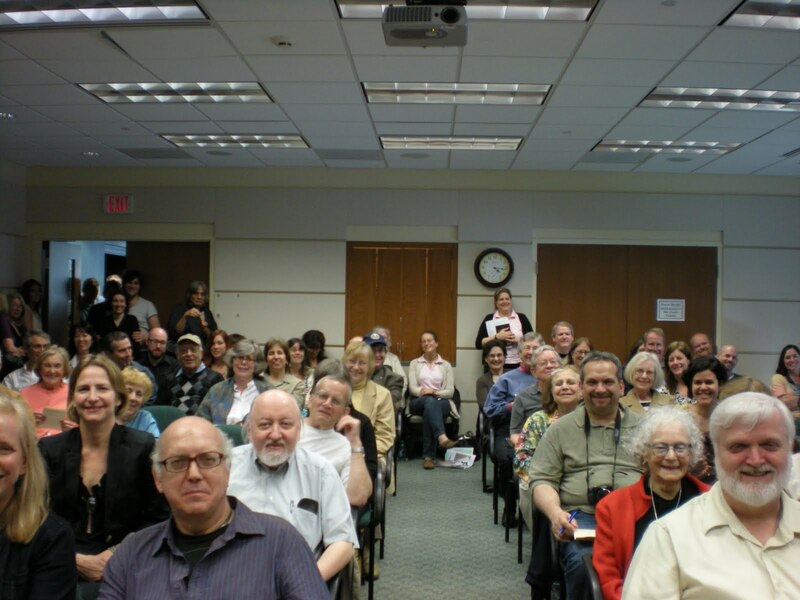 Imagine how happy the poets were to read for an audience like this! 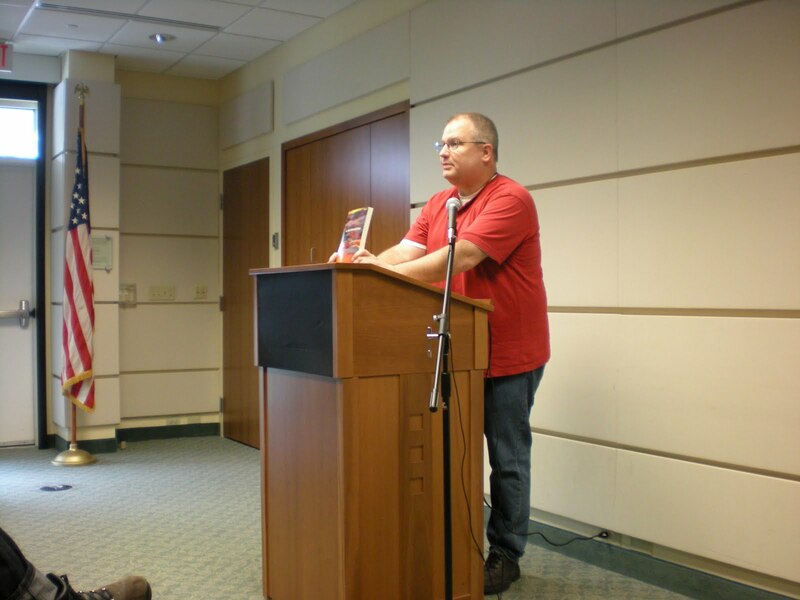 Quincy Lehr, editor of The Raintown Review. Prize for best pants. If you're anywhere near NJ, please join us for the 8th year of this showcase event. "Louder Than a Bomb tells the story of four Chicago high school poetry teams as they prepare to compete in the world's largest youth slam. By turns hopeful and heartbreaking, the film captures the turbulent lives of these unforgettable kids, exploring the ways writing shapes their world, and vice versa. 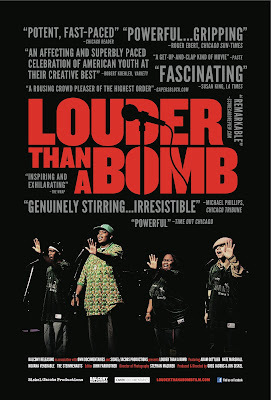 Louder Than a Bomb is not about "high school poetry" as we often think of it. It's about language as a joyful release, irrepressibly talented teenagers obsessed with making words dance. While the topics they tackle are often deeply personal, what they put into their poems—and what they get out of them—is universal: the defining work of finding one's voice." 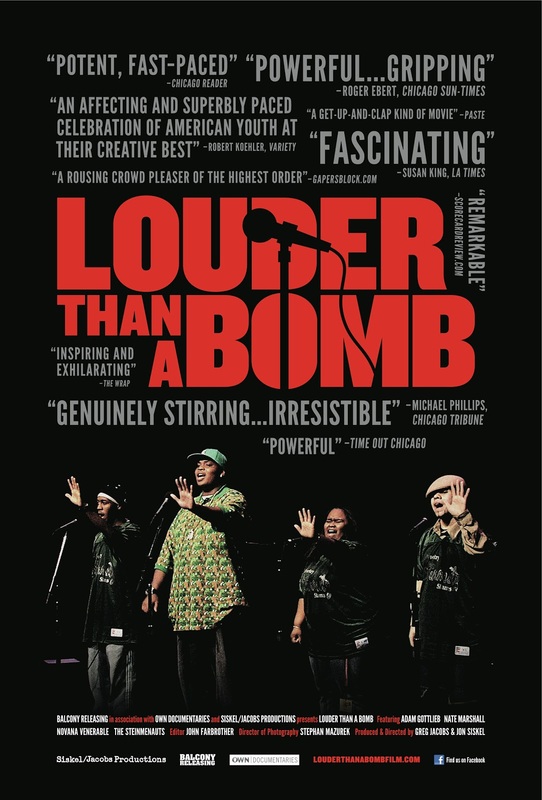 "Winner of more than a dozen film festival prizes, including seven audience awards, Louder Than a Bomb has been hailed as "powerful and exhilarating" (TimeOut Chicago), "inspiring" (L.A. Times), "irresistible" (Chicago Tribune), "a get-up-and-clap kind of movie" (Paste), "vibrant and moving" (The Wrap), and "a celebration of American youth at their creative best" (Variety)." As a poet I can't resist a film about poetry. As a former high school English teacher, I hope that teachers across the U.S. will encourage their students to see this film, not because I want young people to believe that the only kind of real poetry or the best kind of poetry is slam poetry, but because I want them to know that poetry matters, that it can change lives, that it can make the world a better place. If I were still a teacher, I'd take my classes on a field trip to see this film!